Believe it or not, your iPad has an audio equalizer too. It's not as fancy as the physical ones that allow you to manually adjust the levels, but it has a number of presets that will dramatically improve the sound quality of the music you play on your iPad. 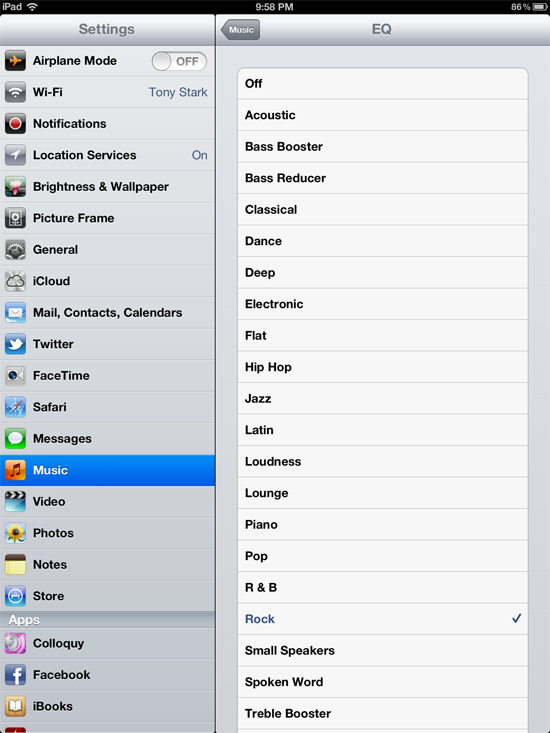 Unfortunately, the iPad's equalizer only changes the audio from the Music app. 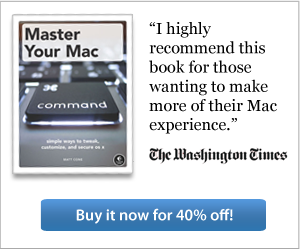 Audio produced by other apps, such as Videos or YouTube, won't be effected by the equalizer. For best results, connect a pair of high-quality headphones to your iPad and start playing music. This will allow you to test the equalizer presets and hear the subtle differences between presets. From the sidebar, tap Music. The screen shown below appears. Tap EQ. The screen shown below appears. Tap a preset, such as Rock. The key is to select a preset that matches the type of music you normally listen to. Keep tapping presets until you find one you like. That's it! 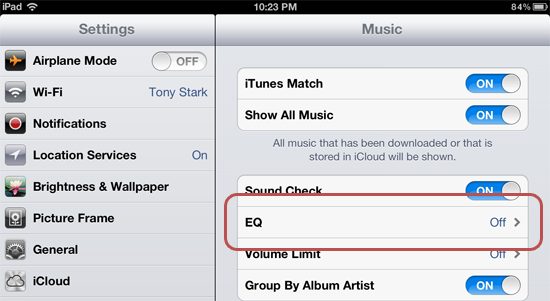 You've set up your iPad's audio equalizer, and it will stay set to the preset you selected until you change it. Can you hear the difference yet?